Connecticut Local Politics is officially moving to its new site, located at www.ctlocalpolitics.net, as of today, Wednesday, January 17th, 2007. This is the final new post that will be made on the current Blogger-powered site, as we are moving on to a new host and to new blogging software (WordPress). Thanks to everyone for their participation in this site, and I hope you will join us at our new URL for more of the same quality content you've come to expect from Connecticut Local Politics. Thanks especially to the Sunlight Foundation for providing the grant that made this move possible. 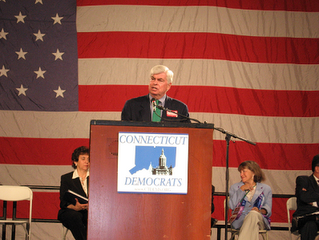 The Courant suggests that Chris Dodd may be a long shot candidate. The Connecticut senator will need all of that effortless charm, that eagerness to engage people and that passion for Democratic causes as he launches his campaign for the nation's highest office. Conventional wisdom says the 62-year-old senator is a second-tier candidate for the presidency. He barely registers 1 percent in most polls, when he registers at all. Many political observers have deep doubts about Dodd's candidacy. They say he may not be able to raise the enormous amount of money he'll need. They say that he's a New England liberal and that he can't distinguish himself and his views from better-known candidates. But others warn he should not be counted out. "This race is pretty wide open," said Joseph F. Keefe, a former New Hampshire Democratic chairman. Keefe supports Massachusetts Sen. John F. Kerry, but his sister, Maura, is a key Dodd strategist. Dodd could have traction, Joe Keefe said, because "there are concerns about each of the major candidates." Is New York Sen. Hillary Rodham Clinton electable? Is Illinois Sen. Barack Obama ready for prime time? Can people see John Edwards as a wartime president? 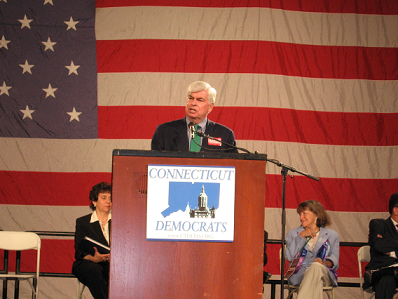 Chris Dodd, the former general chairman of the National Democratic Party and a 32-year congressional veteran, is bilingual and has international experience. In short, he has a golden resume. It's "a big positive," Keefe said. Dodd knows where he stands and is happy to roar about it. "One succeeds when one learns to be oneself in politics," said Connecticut Attorney General Richard Blumenthal, who is running Dodd's Connecticut campaign. "That's what Chris Dodd is able to do." Before Dodd's announcement last week I took some time to research his positions and voting record. Democrats could do a lot worse. But he's also got to show us something. Announcing on Imus didn't help, nor did his appearance on Meet the Press this weekend. Is anyone here excited about Dodd yet? What would he have to do/say to catch your interest? We're a few days behind on developments on the Krayeske affair. Forgive me in advance for a link heavy post. This video shows Rep. Mike Lawlor and Ken Krayeske's attorney Norm Pattis speaking about the case. Hat Tip to Scarce and TrueblueCT for this one. Also, in case you missed it, last week Lawlor live blogged over at MLN about Krayeske and other issues. According to the Courant there will be a hearing. It's being held by the Public Safety Committee and will also include testimony about the recent Internal Affairs report about trooper misconduct. Feel free to include any links that I may have missed in the comments section. Well, state Democrats are at it again. State Representative Tim O'Brien (D-24) has introduced a bill to strip the governor of her executive powers to appoint Connecticut's Senator in Congress in the event of a vacancy. Following proposals last week to strip Governor Rell of her agenda setting authority on the bonding commission is the second attempt to by the Democrat controlled legislature to take away the governor's authority as the state's chief executive. "This is another power grab by the Democrats that threatens to weaken Connecticut's system of checks and balances." said Senator DeLuca. "This trend of partisan and careless legislative proposals is evidence of the arrogance of this majority which seeks to control not only the branch of government to which they've been elected, but the executive and judicial branches as well. "Connecticut Democrats campaigned against this kind of heavy handedness in the fall. Now just two weeks into this new legislative session they are governing quite differently." I happen to agree. The Republicans in Congress attempted actions in the Senate just a few short years ago and I was just as disgusted with them. Governing is not a matter on convenience but is about fairness and compromise. They call it balance of power for a reason. It appears that many Democrats no longer think this balance matters. I guess that's what a veto-proof majority will do to them. I've been busy over at the new site. Go check out the updates, or chat on the forum. Hoping to make Connecticut a national model for safe elections, Secretary of the State Susan Bysiewicz unveiled a proposal this week calling for mandatory annual audits of one-fifth of all polling places. * Requiring all cities and towns to adopt a municipal code of ethics. * Creating a new "do-not-call" list for households that don't want to receive automated telephone calls containing political messages. The bill would make it illegal to place calls to such households, a system already in place in Connecticut to restrict commercial marketing calls. That last one matters. Joe Lieberman could file to run as an independent the day after the primary--the new rule would move the filing deadline back to a month before the primary, which is where it was before the primary was moved to August. The audits are a good idea, as is the code of ethics. And sign me up for a political "do not call" list! I swear, if I never hear Bill Clinton coming out of my answering machine again, I'll be very happy. Phaneuf, Keith. "Secretary of the state would make Conn. national model for election security." Journal-Inquirer 12 January, 2007. Sen. Dodd announced his candidacy for president this morning on Imus in the Morning, which seems a strange place to launch a campaign from. Why, for example, didn't he do this in Connecticut? He'll be heading to Iowa and South Carolina soon, there to tout his experience, his opposition to the Iraq War, and the fact that he's a nice guy who isn't Hillary Clinton. He will be relying on his affable, personable nature and strong talents as an orator to rise above the crowd there. There's a website: ChrisDodd.com, with plenty of multimedia, plays on the word "Dodd" (for example, the Dodd Pod seems to be a collection of podcasts) and the obligatory campaign blog. There are already some issues posted, although a quick glance shows little that separates him from the rest of what is becoming a crowded field. There's also money: about $5 million in the bank. That may be the only plus so far. What there isn't, at least yet, is any kind of buzz about the campaign. Kevin Rennie called Dodd's bid a "busman's holiday of a campaign" and suggested that state Democrats were less than thrilled with it. This will be the most difficult campaign Dodd has ever run. His chances, let's admit, are not good. Even Joe Lieberman began the last cycle in better position, and he ended up in a three way tie for third in New Hampshire. There's no evidence Dodd will fare much better than that. Which begs the question: why is Dodd actually running? Is it, as Rennie suggests, simple vanity? Is he really running for Vice President, or for a Cabinet post in President Obama, Edwards or Clinton's administration? Or it could just be a nice way to cap a long and generally distinguished career. Then again, maybe he actually believes that he can win. In any event, our senior senator is now officially running for president. What's your reaction? Dodd is running for president! You can also go post about it in the forum. Joe Lieberman would never have been re-elected — a strong proponent of the war — against an opponent who was for pullout, if that was the American people's attitude. First, let's take a look at Connecticut's exit polls. They show that sending more troops had the support of — get this — 15% of voters! Meanwhile, 63% of voters said some or even all troops should be withdrawn, in complete opposition to Lieberman's real position. Second, given the total number of people who cast their vote for Lieberman, it's nothing short of absurd to say that it's in any way indicative of anything national. According to the final results, a total of 563,725 people voted for Lieberman — in other words, just over half a million in a nation of 300 million people. Finally, Lieberman won because he was able to misrepresent his views on Iraq, not because voters agreed with his actual views on the subject. Back in July, Lieberman actually said he thought we'd be able to draw down "significant" numbers of troops by now. What's more, Lieberman worked hard to blur the line between himself and Ned Lamont on the Iraq issue. In one ad, for instance, he spoke of wanting to "bring our troops home from Iraq." Our new forum is off to a great start. In addition to the four of us, twelve people have registered and 39 threads have been started. So far our most active forums are those devoted to state and national politics. We also have a forum dedicated to suggestions for the site, and are very eager to hear you sound off about what we're doing right, what we can improve, and what else you'd like to see from CTLP. For those of you who just want to chat, check out our OT Forum for any and all nonpolitical discussions. The forum is part of our much anticipated move to our new home on January 17. Inviting as it may be, I'm not joining the piling-on party. When it comes to securing the safety of the state's highest elected official, you err on the side of caution. No, Krayeske should not have been arrested, and yes, the charges should be dropped. But please don't suggest that the guy should not have been detained for a while, at least until the point police were assured he had no bad intentions. Certainly, they had a right to inspect the nylon bag he carried while running along the parade route to make certain there was nothing more dangerous than a digital camera. I don't think Krayeske was considered a "threat" in the physical sense, but someone who may be inclined to try to publicly embarrass the governor on her big day. His incident got a mention in Tuesday's New York Times. Just imagine the news coverage if someone really did slip by security and harm the 60-year-old grandma in her first elected term. Security and safety are gods in America today--and they have been for a long time, even since before 9/11. We want safer cars, safer schools, safer food, safer air, safer everything, and we're willing to make monstrous concessions in order to get them. This is another. What Stan is suggesting seems so reasonable. Yes, detain him. Search him. He could have been a threat. He might have embarrassed or hurt the governor. The security of the state's chief executive is paramount. He was a known activist, he didn't like the governor. His bag should have been searched, at the very least. It would have been okay to hold him until the police were "reassured." We can rationalize this, and smother it with the numbing and comforting "what ifs" that Simpson provides, but a cold truth remains: Ken Krayeske was arrested because he said the wrong things to the wrong people, and in the wrong way. Hartford Det. Jeff Antuna wrote in his report that Krayeske drew his attention by rapidly riding up to the parade route near Bushnell Park, dumping his bike and running to a position in front of Rell. The state police had his photo because of verbal confrontations between himself and the governor's staff, regarding his candidate's exclusion from the gubernatorial debates. This, in Simpson's words, "unsettled" the state police, and so they provided his photograph to Hartford's police, and the chain of events was set in motion. A man was arrested and detained for hours because of what he said and what he wrote. He was made known to police because his tone of voice "unsettled" the state police. He never threatened the governor. People can rationalize just about anything, from strangers rifling through a woman's purse at the entrance to a ball game to "free speech zones" for protesters at political events to the arrest and detention of innocent men if they believe it will make things safer. If you find that fog clouding your judgement, if you start to think that giving up a little freedom for security now and then is fine, if you begin to forget that our entire country is one great big free speech zone, remember what happened to Ken. Then imagine it happening to you. Pazniokas, Mark. "Activist Arrested At Inauguration Parade." Hartford Courant 6 January, 2007. Simpson, Stan. "Protecting Rell Serves Public, Too." Hartford Courant 10 January, 2007. Judiciary Chairman Mike Lawlor will be liveblogging tonight on My Left Nutmeg. SpazeBoy has his press conference from yesterday in four parts. CT Bob has an interview with Rosa DeLauro. Opponents of Broadwater speak out - and it looks like the New York Department of State has misgivings. An interesting challenge to the constitutionality of the Death Penalty is brewing in Hartford. Rabid Raccoons? Yes, rabid raccoons. State Dems look to change bonding rules to end Governor's monopoly. An economics Professor takes George Will's latest Courant column to task. I. Charles Mathews, a blast from Hartford's political past, is expected today to announce his candidacy to run against Mayor Eddie A. Perez in the 2007 election. Mathews, a former deputy mayor in Hartford, joined a growing list of candidates seeking to oust Perez, who on Tuesday made official his bid for re-election by registering as a candidate with the city clerk. Mathews said his candidacy will concentrate on a revision of the city's strong-mayor charter, fine-tuning the document to provide enhanced checks and balances against the mayor. Others currently in the race are former State Rep. Frank Barrows and current State Rep. Art Feltman, both Democrats. The consensus this year is that Perez has made a lot of enemies in Hartford, and he is seen, among other things, as power-hungry and out-of-touch with the residents of the city. He still remains a powerful force in Hartford, however, so it remains to be seen whether any of the current crop of challengers can take him down. Above all of this is the quiet but persistent rumor that Denise Nappier might join the fray, although she hasn't said anything either way. Goren, Daniel. "Another Mayoral Candidate." Hartford Courant 10 January, 2007. Much of the online coverage of the arrest of Ken Krayeske has, rightfully, focused on the existence of a "Threat List" kept by law enforcement officials (see here, here, and here). At approximately 13:20 I was in an unmarked Police vehicle at the corner of Ford Street and Pear Street when I observed the accused suddenly ride a mountain bike at a high rate of speed directly up to the parade route, dump the bicycle, jumping off it, and then running up to the parade procession directly in front of where the Governor was passing by in the procession. As I exited my vehicle and ran towards the accused I observed State Police Detective Pedro Rosado approach the accused just as the accused was stepping off the curb into the parade route, toward the Governor. Detective Rosado had placed himself between the accused and the Governor's path, I then grabbed the accused by his right arm and escorted him away from the Governor, and the parade route, which he resisted by attempting to pull away from me. When I spoke with Nancy Mulroy, spokesperson for the Hartford Police, she indicated that the arrest was made as a reaction to "aggressive behavior." And the behavior, according to the police report, certainly sounds aggressive. In fact, according to his website (which, given the potential for litigation, I am taking for accurate as he will have to produce the time stamped photographs in court), he had time to take 23 photographs at that location before he was arrested. This does not line up with the timeline provided in the police report. But one witness to the arrest, Eliot Streim, contradicted the police account. Streim, a Hartford lawyer who was watching the parade with a colleague, said police did not intercept Krayeske as he ran into the parade route. On the contrary, Krayeske photographed the governor without incident and was detained by police only after Rell had passed by, Streim said. When I asked Nancy Mulroy where the camera was when the arrest was made she indicated, based on the listing of "Nylon bag... containing photographic equipment" in the property section of the police report, that the camera was in the nylon bag. Again, the photographic evidence makes this difficult to believe, and it is equally hard to believe that Ken Krayeske's behavior could be perceived as "aggressive" if he had a camera up to his eye. Finally, Ms. Mulroy conveyed to me that the arrest, setting of bail, resetting of bail, and release timeline was not based on the end of the inaugural ball, but on the logistics of arrests in Hartford. The Hartford Police Department has holding cells, but not a jail, so the original bail was set ($75,000) at the police department by a Marshall and the delay was caused by the wait for a regularly scheduled shuttle to the jail. The bail was changed to a promise to appear at the jail and the further delay was caused by the wait for another regularly scheduled shuttle back to the Hartford Police Department for processing for release. Assuming this is accurate, and I have no reason to believe that it is not, its fine as far as it goes, but it is not an adequate justification for the extremely high original bail. Ms. Mulroy indicated that the original bail was set with an eye toward Mr. Krayeske's previous criminal record. But his criminal record contains only three arrests for non-violent civil disobedience - hardly the stuff that makes for high bail. Taking all this together, and in the prism of the existence of a "Threat List," the question that emerges is Was Ken Krayeske arrested because of his actions or for some other reason? More information than the police report will be necessary to adequately answer the question and it is encouraging that Governor Rell and Judiciary Chairman Mike Lawlor are interested in investigating further. Update: I should add that, given the police department's knowledge of its own procedure and of how long Mr. Krayeske would be in custody if he made the trip to the jail, the high setting of the bail could have been undertaken with the knowledge that it would ensure him remaining in jail until midnight or one in the morning. I am not arguing that this was some nefarious plot; I am just arguing that the simple fact that the regular procedure caused him to remain in jail for so long doesn't let HPD off the hook - they could have been using the procedure as a tool. MARK PAZNIOKAS, "State Called Man `Threat'", Hartford Courant, January 6, 2007. Ken Krayeske Arrest Report, Hartford Courant, January 6, 2007. In honor of the site's second anniversary, we will be leaving Blogger and going live exclusively on the new site by January 17th. Go bookmark both sites now! Several lawmakers said they were outraged, calling for legislative hearings and saying the incident reeks of a secret police force and should not be tolerated in Connecticut. [Commissioner Leonard] Boyle Monday denied the state police keep a list of political enemies, saying that the notion is "completely incorrect." "We do not maintain such lists," he said. Krayeske's lawyer, Norman Pattis, said police had no reason to detain Krayeske on a high bail, and then release him without bail once the governor's inaugural ball had ended. Obviously there should be a probe. Why was Ken on that list, or why did he meet "federal guidelines," as is stated here? Are blogs and other sites actually being monitored by law enforcement? And Pattis is correct--the high bail, then the release after the ball was done, are both highly suspicious. Keating, Christopher. "Probe Urged After Arrest Of Activist At Rell Parade." Hartford Courant 9 January, 2007. Lieberman and U.S. Sen. Lindsay Graham, R-S.C., co-authored a letter to President Bush "strongly encouraging" him to send more troops "to improve the security situation on the ground." In a July 6 debate with Lamont, Lieberman said he was "confident that the situation is improving enough on the ground that by the end of this year, we will begin to draw down significant numbers of American troops." Lieberman's Iraq policy was never all that clear during the campaign, so this, which appears to be more of a modification of his earlier pro-war stance and not an about face, probably won't either surprise or alarm most voters. Still, Lieberman hasn't been entirely consistent as he claims, and he certainly never suggested a troop "surge" like what he is proposing now. The campaign may have gone differently if he had. Lieberman effectively neutralized his nebulous stand on Iraq as an issue, instead focusing on partisanship, but if he had expressed support for the "surge," which is turning out to be an unpopular position, he probably would have had a tougher time of it. Lieberman needs to explain why and how his thinking on Iraq has shifted. To claim that this has always been his position, and that he has always been consistent on Iraq, is to rewrite history. Lockhart, Brian. "Critics rap Lieberman position on troops." Stamford Advocate 9 January, 2007. According to News Day (via AP), Governor Rell is on the case. She [Governor Rell] called on Commissioner Leonard Boyle to review the circumstances of Krayeske's arrest and determine how he came to the attention of state police and how his name and photograph were provided to the Hartford Police Department. "In this environment of heightened security, the use of information must be balanced with the individual rights of our citizens," Rell said in the letter. "In providing security and protection, we cannot permit the rights of individuals to be trampled." Colin McEnroe has the text of the letter that Rell sent to Department of Public Safety Commissioner Leonard Boyle. House Judiciary Chairman Mike Lawlor was just on Colin McEnroe's show and indicated that web sites and blogs were being monitored to look for potential threats. Lawlor Quote: "Apparently state police employees were trolling the internet, blog sites prior to the inauguration seeing if anyone was talking about any type of interference of the Inauguration. And they encountered Ken Krayeske's one post that to me is not at all threatening..."
As you may or may not remember, Connecticut Local Politics is going to be moving off of Blogger's free server space (and away from Blogger's platform altogether) and onto another host. This means a few changes, such as a change in URL (our new URL is the much shorter and simpler http://www.ctlocalpolitics.net), better reliability (meaning less downtime and slowdowns), more organization and functionality for the blog itself and some new features that we hope you'll like. The first of these new features is a bulletin board/forum, which is now located at http://forum.ctlocalpolitics.net. Think of it as a perpetual open forum, where members of this community can talk to one another about all kinds of issues. One area is for comments about what sorts of things you'd like to see out of this site in the future--and I hope you'll put your two cents in! You can also check out the blog site, but there's very little there right now. I'll be importing files to the new site over the next few weeks. FYI - You will need to register to post on both the blog site AND the forum. Sorry about that--I'm working on creating a single login for both, but haven't yet figured it out. I've been sorely neglecting the town weeklies over the last year, and I'm going to start to remedy that now with a look at some of the political stories out there in our towns. Wethersfield has a new mayor after Mayor Russell Morin became a state representative. The new mayor is lifelong Wethersfield resident Andrew Adil, a Democratic town councilman. Adil said he feels "an obligation to pay the town back for all it has done for me." He also thanked ex-mayor Morin for all he had done as mayor, but especially for his dedication to cleaning up the Wethersfield Cove. Adil added that he hopes to continue to work on what services the town offers residents, and to work with the Economic Development Improvement Commission (EDIC) and the newly formed redevelopment agency. Democrat Paul Montinieri was also appointed to the council. Gould, G.C. "Town council appoints new mayor and councilor." Wethersfield Post 4 January, 2007. "...[W]e (Darien) haven't had enough people over the years to run for the RTM, which is directly attributed to people not understanding the board's role in town," [Commission member] Tallis said. "The RTM is extremely critical to how this town functions, and it will be our goal as a commission to communicate that, and other such pertinent information, to the public." The RTM structure is somewhat common in southwestern Connecticut, but almost nonexistent elsewhere in the state. Foster, Brian. "Charter Review to Begin." Darien News-Review 4 January, 2007. Democratic First Selectman Ken Flatto and Selectman Denise Dougiello have filed paperwork in the town clerk's office as a first step in testing the re-election waters. Although Flatto acknowledged that the filing was "a little early," he said the decision was based on a large number of supporters who expressed "desires of setting up a committee." There is no Republican candidate as yet. Lynch, Erin. "Exploring Re-Election." Fairfield Citizen-News 5 January, 2007. The Board for Admission of Electors voted 3-1 to adopt a 10-page decision denying Jerry and Marianne Porricelli voting and residency status, noting that even though their property straddles the Greenwich-Stamford border, their house is entirely in Stamford. The Porricellis have argued that before they moved to the 9 Hillcrest Road home, the town's registrars assured them in writing repeatedly that they would remain Greenwich voters. Greenwich is a weird place. Enough said. Cassidy, Martin. "RTM member can't vote." Greenwich Time 8 January, 2007. What other local stories are out there that I'm missing? A panel has recommended that Connecticut should consider returning tolls to its highways to raise revenue and better manage congestion. The Transportation Strategy Board issued its report on Friday and calls for legislation to pay for a comprehensive review and analysis of electronic tolls and congestion pricing. The board said that without some new source of revenue, Connecticut will be unable to pay for numerous highway projects on the drawing board. So! How many legislators out there are willing to vote for a bill putting up toll booths on I-95, I-84 and I-91? "Panel Recommends Reinstating Highway Tolls." Associated Press 7 January, 2007. Bridgeport Mayor John M. Fabrizi filed for re-election. Also it was unusually warm yesterday. I hope you had a chance to enjoy it. On Thursday I crashed a party and had the experience of being physically blocked from a politician by a quick footed aid. I thought the incident was really funny, and I knew that a few blogs would link to Gabe's account of the incident, but the speed and distance at which the story spread surprised me. By now I'm so used to Joe Lieberman's open contempt for those who disagree with him that it's what I've come to expect. The biggest surprise for me, was that the people at the door didn't have the standard enemies list in hand. Looking at the story through the filter of Ken Krayeske's arrest I have a better understanding of why our experience caught so many people's attention. Elected officials are voted in to represent us, even those of us who don't agree with them politically. The lengths which Joe Lieberman went through to avoid an encounter with bloggers was comical. The lengths which Governor Rell, or at the very least people acting on her behalf, went to avoid an encounter with one of her political opponents is frightening. Many of you probably know Ken Krayeske from his comments on CTLP. He frequently contributed to threads, especially those pertaining to the Governor's race where he served as Cliff Thorton's campaign manager. I've never met Ken, but I am fairly familiar with his political views and affiliations. There is no reason for him to be on a watch list. The idea that he would attempt to harm Jodi Rell or anyone else is just crazy. The most disturbing aspect of the story is that Krayeske was held on a $75,000 bail until Rell's ball was over, and then released with a promise to appear. Was there a concern that he might attempt to crash? And then do what exactly? The Courant article does mention a comment Krayeske made on CTLP about the ball, but he certainly didn't make any threats here or anywhere else that I can tell. That our tax dollars would be spent on keeping Ken Krayeske in jail for the duration of a party is also crazy. Both Joe Lieberman and Jodi Rell have built their political brand on the idea of working across the aisle with those who don't necessarily share their views. This week we saw two more examples to counter that popular image. Lieberman's behavior was smooth but comical. In the end his actions didn't cause anyone harm, and we got a great post out of it. The same cannot be said about the arrest of Ken Krayeske. This story is finally making its way into the mainstream media. The Courant website has a Mark Pazniokas story about the incident on their front page, and has obtained the arrest report (pdf). Colin McEnroe has been following this very closely, you can see two posts on the subject on his blog here and here. Colin is right--the one who should be acting to shed some light on this very, very ugly and disturbing incident should be the governor herself. Here's what I'd like to know: Why was Krayeske on CTIC's list? Who else is on that list? How much did the Rell Administration know about that list? Why was bond set so high? Also, I noticed that the Courant article references statements Ken made on two websites, one of which is a comment on this CLP post, as proof of his "hostility" towards Rell. I have a feeling we'll see this story on the front page of some state newspapers tomorrow. Yesterday afternoon MattW of MLN, Gabe, and myself were attending newly sworn in Congressman Murphy's open house when he received his first call to the floor for a vote. As he walked out the door an excited Murphy explained to his well wishers: "I've got to go vote!" His enthusiasm for the moment was actually quite touching. We attended a total of six events yesterday, mostly for the CT Delegation. There was a viewing party for CT Democrats to view the opening session, both Murphy and Congressman Courtney had open houses in their new office space, and the CT Democrats Delegation reception at Union Pub. After a brief visit to The Lieberman party we topped off the night at the Netroots celebration. It was a beautiful day in DC, warm enough that I kept forgetting it was January. Most of the afternoon was spent inside the various House office buildings, which I'd never visited before. As we traveled from office to office it was difficult not to get distracted by the many names I recognized on the plaques. Below are my best recollections of the various events we attended. Our first stop was at the joint reception/viewing party for supporters of Murphy and Courtney. The Courtney campaign had organized a bus trip for supporters and many if not most in the room were wearing their Courtney for Congress campaign buttons. A television set was set to C-Span where the opening session of Congress was being broadcast. I'm pleased to report that Rep. Murphy's office is not, as had been previously reported, that difficult to find. It's also a fairly large space and most of the time guests were able to move from place to place easily. Courtney's office is smaller, or at least it felt that way. I saw mostly the same faces at both parties. Union Pub is a large bar, but it was packed with people and had a healthy overflow outside. In addition to the now familiar faces from the other events I also saw our four Democratic Reps, Diane Farrell, and Nancy DiNardo. Gabe and I also met Senator Chris Dodd and State Rep. John Geragosian. This is the first bar I've ever been in where C-Span played on multiple TV screens. I was even more amused by how closely people were paying attention, especially staffers of the Congressman who would at some point need leave the party to cast another vote. My one pet peeve were the amount of people who showed up proudly wearing their Lieberman buttons. But since I crashed Lieberman's party later on in the evening I can't be to upset by that. Lamont supporters were well represented in the crowd though, and we ran into several people from the campaign including Tim Tagaris. The only thing missing from Gabe's post about this was the number of Democrats who also attended Joe's bash. I'm not sure who were actual supporters, who (like myself) were just curious to see which big names were in attendance, and who was just hungry (Joe had more food). I spotted both Nancy DiNardo and Chris Shays in the crowd. Our final stop of the evening was the Netroots gathering. It was also quite crowded, but we were able to say hello to a few friends, and meet MyDD's Chris Bowers. Freshman Congressmen Patrick Murphy and Tim Walz attended the festivities. We left not long after the Champagne toast. As I look through my notes on the parties, one emerges:dominance of C-span. It was playing in almost every room we were in, and functioned like a sort of clock for staffers. If a vote was about to be called C-span gave staffers a good idea of when they'd need to get to get their boss on the floor. It also gave them a good idea of when the Congressperson might return. 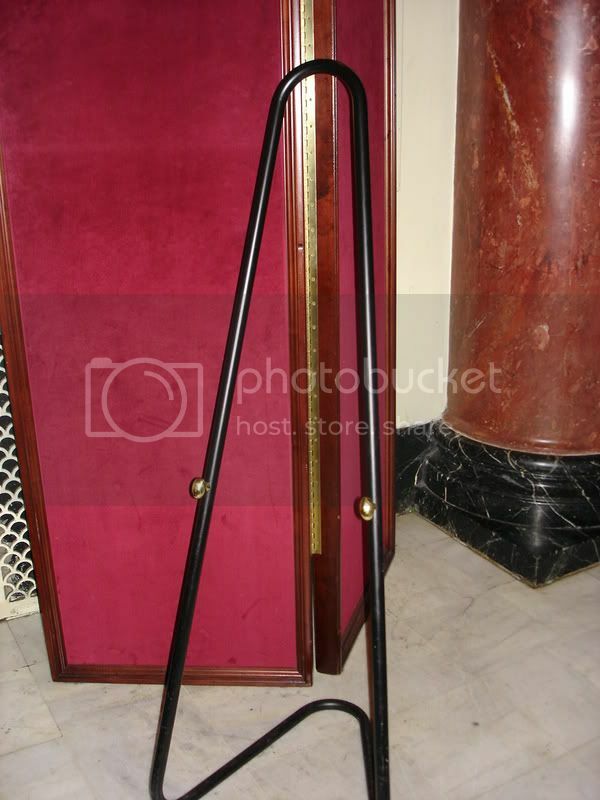 Second, while we were there to have a good time, the 110th Congress was getting down to work. We were celebrating our victories while Joe Courtney, Chris Murphy, and a host of other Freshman were getting sworn in and casting their very first votes. The following is a quick post written exclusively for Connecticut Local Politics by U.S. Rep. Chris Murphy (D-5th District) describing his first day on the job. Thanks to Rep. Murphy for staying in touch despite a very busy schedule! -G.C. This week has been nothing short of an awe-inspiring experience, and I wanted to use my first post as a new Member of Congress to share the excitement. The night before I drove down to Washington, we hosted a send-off party at Zabarra’s in New Britain. The event gave me a chance to catch up with many of the people I hadn’t seen since the election, and hearing from supporters who played such a huge role in the campaign really added to the excitement. After driving to Washington in a car packed with Ikea boxes and a few suits, I arrived just in time to catch a glimpse of my office for the first time before rushing off to a meeting with the Democratic caucus. Meanwhile, my staff rushed to get the office ready for the swearing in on Thursday, as we were expecting more than 100 supporters who were traveling from Connecticut to stop by to see the office. As Thursday dawned, it had all the makings of a day I wouldn’t soon forget. With all my family in town for the ceremonies and celebration, I couldn’t believe I was finally on the verge of joining the 110th Congress. I walked up the steps of the Capitol with my fiancée, Cathy, to go to the floor of the House of Representatives for the swearing in activities. At the top of the steps, I surveyed the mess in front of the Capitol where construction of the Capitol Visitors Center is in progress, and I said, “What a mess.” Of course, the mess here is little more than a few holes in the ground and construction cranes scattered about -- the real mess to clean up is Congress itself. Before the swearing in ceremonies began, I sought out Congressman Shays on the floor of the House to tell him that I was looking forward to working with him over the course of the next two years. We spent a little too much time chatting, as when I returned to the Democratic side of the chamber, there were no seats left, so I stood in the aisle along with several other Members to take the oath. The atmosphere in the House chamber was electric, and when Speaker Pelosi walked in, the crowd on both sides of the aisle erupted in thunderous applause. The next few hours flew by as members of the leadership spoke and I was sworn in before rushing down to the second floor of the Capitol for a private swearing in ceremony with the Speaker. The ceremony was “private” indeed: my family and I, Pelosi and the 50 or so television cameras set up from stations across the country there to catch their local Member being sworn in. What a rush! My family and I then spent a few minutes in Statuary Hall to take some photos. I was eager to get up to the office see some of the supporters who were in town for the day, but I was only there for a few minutes before I had to go the floor for our first round of votes on the ethics reform measures that are a part of the Democrats’ ambitious “100 Hours Agenda”. I am so proud to be a part of a Congress that, on the first day of business, passed legislation that will hopefully begin to restore the public’s trust in their Congress. Thanks for letting me share my experiences with you, and I’ll see you back in Connecticut in the coming weeks! There will be more content about what's going on in D.C. later on today. Here in Connecticut, State Rep. Patricia Dillion (D-New Haven) was arrested for driving drunk, and has issued an apology. Dillon defeated her Republican opponent by a margin of 90%-10% in November. Also, business leaders are pushing for more pro-business legislation, which is no surprise. CT News Junkie has a report on the arrest of reporter and Thornton campaign manager Ken Krayeske for, apparently, taking pictures of the inaugural parade. This is very, very ugly, and I would hope the charges would be dropped. CGG contributed to the creation of this post. 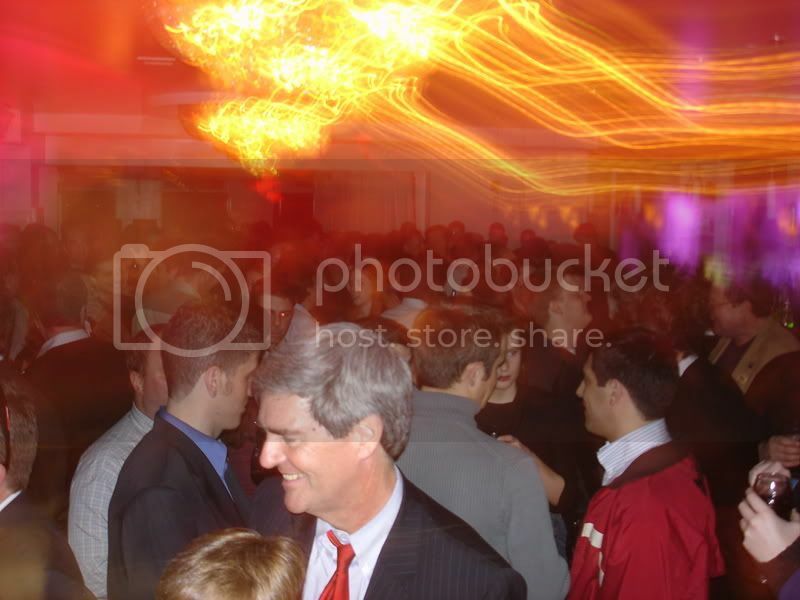 All pictures were taken by CGG, except for the Party Shot which was taken by Chris Bowers. CGG and I spent yesterday in DC enjoying the pageantry of the celebrations surrounding the incoming 110th Congress (which CGG will post on extensively later). We were sitting in the Union Pub at the Connecticut Democratic Delegation's Welcome Party for their new members when we were informed that we were just across the street from Senator Lieberman's party. What's an intrepid Connecticut blogger to do? Crash, of course (especially since we had seen every Connecticut Democrat at the party, but didn't see anyone elected on the Connecticut for Lieberman line)! So we walked across the street to Union Station and thought that we could walk right in if we looked confident. No dice, the doormen informed us that we would have to check in to enter. Anticipating the need to perform a song and dance about why we were not on the list, I launched into a story about why we had not RSVP'd only to be cut off about two words in by a "we don't care who you are" look and the handwriting of our names on name tags. We were in. With the sign gone we felt silly standing by the empty stand, so we went in search of someone we knew to talk to and immediately happened upon Dan Gerstein. After introducing ourselves (I had spoken with him in the past but only via phone), Dan gave us a nice compliment regarding Connecticut Local Politics (but managed to also take some shots at Connecticut's other blogs - not everyone who disagrees with you is crazy), gave me some helpful tips on how to snag a future debate for the Law School, and just generally proved that, when no one is paying him to do otherwise, he can be a really nice guy. If you look really closely over our shoulders you can see a sunrise sunset. Joe Lieberman: [sour look] We got killed in Town. All is forgiven. DTC: [semi-sarcastically] I forgive you too, Senator. The sight of Senator Lieberman forgiving a town chair for working to elect the Democratic nominee (you know, doing his job) warmed my heart, so I was glad to see the town chair give it back to him a little and "forgive" him for running as a petitioning candidate. We also witnessed the Senator visibly recognizing CGG, motioning an aide over, and the aide trying to stay between us and the handshakes. While the aide was a lovely dance partner (call me! ), after a few persistent minutes of the handshake soft-shoe, I was finally face to face with the Senator. I greeted him with "Hi Senator, my name is Gabe and I am with the Law School Democrats. I just wanted to let you know that, while we don't agree on everything, I really appreciate your decision to continue to caucus with the Democrats." The moment the words "Law School Democrats" was out of my mouth (or was it the word "Gabe"? ), he gave me a withering look and turned his back to me to greet other well wishers (we hosted an event for a certain Mr. Lamont of Greenwich), pausing only to turn back around for more dagger looks when I said that I didn't agree with him on everything. Deciding to go for broke, I reminded him of the letter that the Law School sent him inviting him to speak, and asked him if we could host him next semester. Half smirk solidly in place he shook his head no, turned his back again and maneuvered an aide between us. Senator Lieberman (D ID PCotCfLl - CT), gracious in victory. When we walked in, we were greeted by Lamont Internet Guru Tim Tagris who let us know that he had already had a call asking him if he was one of the bloggers who crashed the Lieberman Celebration! Update: Sorry about the formatting, but it should be fixed! Update II: Here is a scanned invitation to the event. The sign mentioned above was substantially similar - The only differences that I remember from my brief glimpse before it was hermetically sealed away in an undisclosed location are that the sign had the corporate sponsors listed one on top of the other and that there were more sponsors on the sign. Update III: tparty over at MLN points out the lobbying/sponsorship connection. Shays will spend his time supporting the Democratic majority on issues he cares about, like ethics reform. Weirdly, he may actually have more power and influence now than he did when his own party controlled the House--not only is the Northeast in general more influential, but Shays, who is sort of playing the role Joe Lieberman played in the Senate for a long time, can make a very effective go of it by being the token Republican to support various Democratic measures, and by being a moderating influence. Which means that unless Democrats in the 4th District can field a stellar candidate in 2008, Shays might be around for a long while to come. The major points against him last time were Iraq and his party affiliation. He moderated his position on the former and the latter may turn out to be a strength in 2008. For now, however, I have a feeling we'll be hearing a lot about Rep. Shays in the months to come. Lightman, David. "For Shays, New Term With No Old Faces." Hartford Courant 5 January, 2006. Read about it here. Now we'll see if they can deliver. 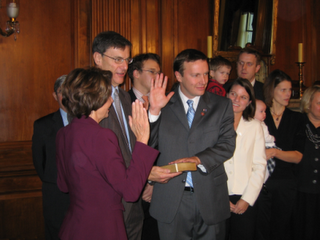 New Congressmen Chris Murphy and Joe Courtney were sworn in this morning. Democrats are proclaiming a new beginning for the legislative branch. What do you think? What are your expectations for the 110th Congress? They can't be any worse than the 109th, right? So what's worth talking about today? 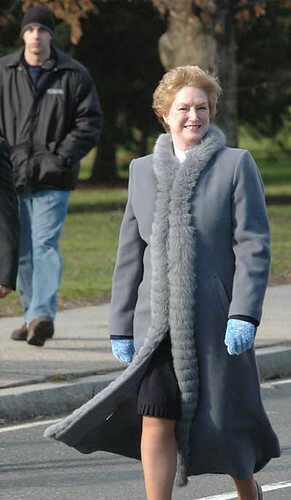 The lieutenant governor? He really needs to get a cable access show like Rell had. The rejection of rules changes by the Democratic majority? Inclusion of special ed kids into regular classrooms? People actually seeming to like RellCare? Our newest House members have their webpages up: http://courtney.house.gov/ and http://chrismurphy.house.gov/. Not much there yet besides the basic template. What else is happening around the state? The situation in Iraq is a lot better, different than it was a year ago. The Iraqis held three elections. They formed a unity government. They are on the way to building a free and independent Iraq. Their military -- two-thirds of their military is now ready, on their own, to lead the fight with some logistical backing from the U.S. or stand up on their own totally. So I am confident that the situation is improving enough on the ground that by the end of this year, we will begin to draw down significant numbers of American troops, and by the end of the next year more than half of the troops who are there now will be home. "After speaking with our military commanders on the ground," he said Wednesday in an e-mail, "I strongly believe that additional U.S. troops must be deployed to Baghdad." Lieberman, D-Conn., visited Iraq last week with a Senate delegation. Greg Sargent, at The Horse's Mouth, wondered who the commanders were, noting that Gen. John P. Abizaid, the senior commander in the Middle East, Gen. George W. Casey Jr., the senior American commander in Iraq, and Lt. Gen. Peter W. Chiarelli, the second-highest-ranking American officer in Iraq have all resisted a troop increase. Needless to say, there was much discussion in all of our meetings - whether with Iraqi leaders, American or British commanders, or rank-and-file troops - about whether or not more American troops are needed. My conclusion is that it would be a mistake to send more troops to Baghdad. Prime Minister Maliki did not welcome the prospect of more American troops and indeed seemed frustrated that he did not have more control over his own troops. One American general told me that a jobs program in Baghdad would do more good than additional troops. And it seems to me that the Iraqis themselves need to step up to deal with the sectarian violence plaguing the Baghdad region. Ultimately, resolving the sectarian violence requires a political, not a military, solution in which the Sunni minority is more fully integrated into the government. So who did Senator Lieberman speak with, leading him to believe that the answer in Iraq is more troops? And was Senator Collins not included in those discussions or did she just draw radically different conclusions based on the same available evidence? Or is someone not being entirely truthful? Transcript, Lieberman, Lamont Spar in Conn. Primary Debate, Washington Post, July 7, 2006. David Lightman, Lieberman Presses Case For More Troops In Iraq, Hartford Courant, December 21, 2006. Joseph Lieberman, Why We Need More Troops in Iraq, Washington Post, December 29, 2006. Greg Sargent, WHICH "COMMANDERS ON THE GROUND" PERSUADED JOE LIEBERMAN THAT MORE TROOPS SHOULD GO TO IRAQ?, The Horse's Mouth, December 21, 2006. Fairfield University Professor John Orman's takeover of the Connecticut for Lieberman Party became official today. The Secretary of the State's office has recognized Orman's takeover, and will keep a copy of the CFL rules on file. 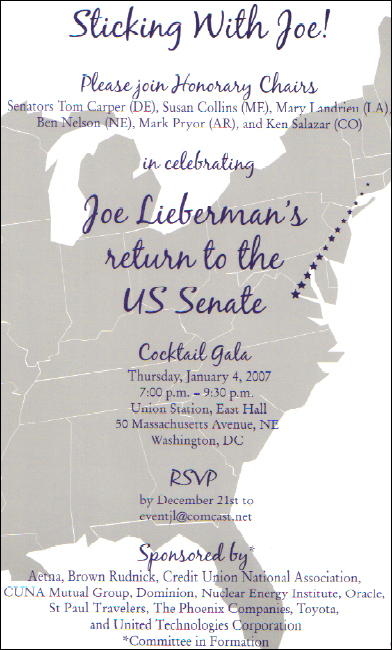 Members are required to be either critics of the Senator, or have the last name Lieberman. According to the Courant Orman was surprised by his success at overtaking the party. Currently he is the only registered member, but hopes that will soon change. Orman, who had considered running before Lamont entered the race, unsuccessfully petitioned Bysiewicz to prevent the creation of a party for one man. He said he was surprised his takeover bid succeeded. "I thought Susan (Bysiewicz) would write a letter saying 'You cannot have a party of one person. It's ridiculous. You're mocking the system and Connecticut for Lieberman does not exist because Senator Lieberman doesn't want it to exist,' " Orman said. 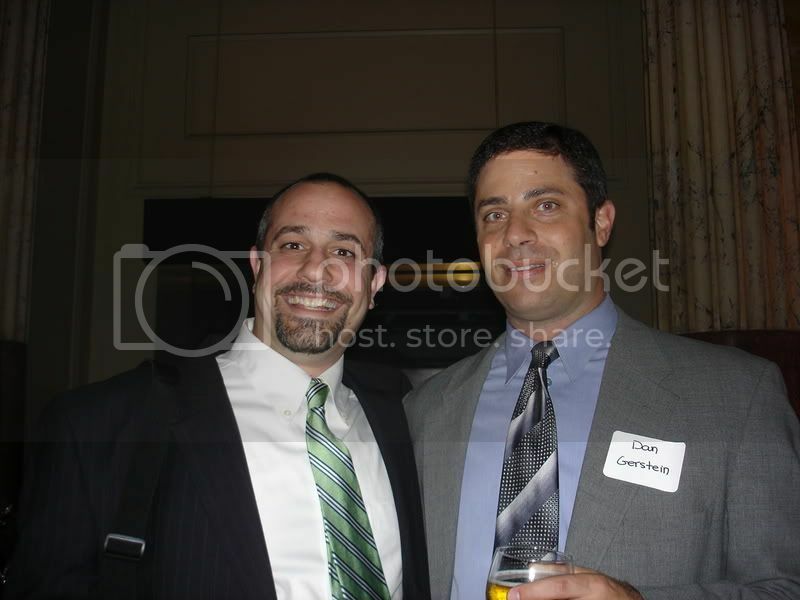 Since Lieberman remained a member of the Democratic Party, Orman is the Connecticut for Lieberman Party's sole member. But, he hopes to change that soon. Orman plans to hold a meeting later this month to bolster the party's ranks. "I'll send an e-mail to critics, bloggers, opponents (of the senator's) and maybe anyone named Lieberman," Orman said. I'm surprised that Orman was able to get recognition so quickly, but then I was also surprised that Lieberman was able to create a new party right after losing the primary. You know, I've been thinking about that speech, and now that I've actually read it instead of listening to it, I have to say, it really isn't all that good. In fact, while it's not the worst speech I've ever read by far, it's pretty bland. But when I was watching it, I kind of liked it. I thought it was a nice speech given by a nice lady. That makes me wonder--am I some sort of gullible sap when it comes to Rell? Are my expectations for the executive branch so low or so altered in some way that I'm ready to stand up and cheer whenever she gives a mediocre speech without tripping over her lines? Am I so desperate for our leader to, well, lead that I think every half-baked, incomplete plan is a great idea? Does she emanate some sort of mind-control ray? Or is it that she's just very likable, very unpretentious and very human? She seems like one of us. Maybe that's why so many people root for her. I believe Rell is capable of so much, if only she would realize it. There's great potential in an apparently unpretentious, sensible, selfless and decent politician, and the landmark 2005 session of the General Assembly suggests that she, along with the other leaders of our state, can accomplish an awful lot of good together when pressed. I want her to realize that potential. Maybe that's why I'm willing to give her a pass from time to time. But I think my patience is starting to wear a little thin. If she is to accomplish great things, now, in the first year of her own term, is the time to do it. I will be watching. So will a lot of others who placed their faith and trust in Jodi Rell. You can watch the inaugural festivities, which will involve marching, weapons being discharged, silly costumes, vague speeches and the interior of the Legislative Office Building, on CT-N.
Rell was sworn in for a full four-year term as governor, and delivered a short, hopeful speech. As the Rell team has been saying, it didn't provide specifics for the future, but instead was much more general. It was a decent speech, however: well-written and well-delivered (for Rell, anyway--she is a very restrained speaker). Connecticut has a new Lieutenant Governor. The House and Senate have both begun the new session. See CT News Junkie for the complete list, but maybe the biggest news here is that newly-minted Democrat Diana Urban will be vice-chair of the General Administration and Elections Committee. From John Dempsey to Ella Grasso to John Rowland, all governors have spoken to a joint session of the legislature in the Hall of the House at the state Capitol in a tradition that covers Democrats and Republicans. So why not give two general speeches? This is either very sneaky and clever or sort of lazy. Colin McEnroe reports that Rell is promising some "surprise guests." I'm hoping for Gary Coleman. Also, don't forget the very expensive inaugural ball, to be held at the CT Expo Center. ...Wait, the Expo Center? Don't we have the John G. Rowland Memorial Convention Center for this sort of thing? I suppose the theme for the evening will be Drafty Concrete Wonderland, or perhaps Magical Night in a Storage Shed. You can watch all the festivities on CT-N today. That's what I'm going to do. Keating, Christopher. "One Speech Only." Hartford Courant 3 January, 2007.